At first, I couldn’t understand why Instant Coffee would deep-six itself into a Fallout Shelter. Their motivations for doing this seemed rather obscure to me. Weren’t bomb shelters a thing of the past? The millenialism of the gesture a little late? A garden today more readily evokes narratives of sustainability. Whatever the state of contemporary geo-politics, there is hardly a nuclear winter on humanity’s horizon. Ah, survival. So IC sees its future to be much like its past. Improbably succeeding, setting the agenda. Outwitting and outlasting and the competition. Still here. Ha. And if the terminus point imagined seems a bit grim, well, artworks are never only about the artists that make them. Implicit to Instant Coffee’s Fallout Shelter project is a larger narrative about the fate of all utopias. Now clearer that my first impression had been too literal, I remembered that I had always kind of misunderstood what IC was trying to do. And I was not alone in this. Severed from work done in a specific medium, the zone of representation is a tricky substance from which to hone an art practice. This is especially true if you hardly bother to—or deliberately avoid—differentiating what you do from representation’s more mundane existence as the language of commerce. Perhaps, too, because of the collective’s proven ability to anticipate the forms of their ongoing relevance which is on pace with wider art world trends, but may be a little in advance of their audience, the Instant Coffee project has always been somewhat misunderstood. Throwing parties will do that to your reputation; enjoyment, for some reason, is one of the more hypocritical realms of human experience. The art show as party was the original format of IC-engineered inclusivity. In the collective’s own words, creating event-based exhibitions was a way to “renegotiate…traditional exhibition structures”. In the process, they jettisoned outmoded medium-specific hierarchies of the more traditional exhibition venues. The claim is funny in itself. Self-aware and proactive, it lives up to the ideal of truth in advertising, yet partakes of the peculiarly Canadian preoccupation with being nice and non-threatening. To embrace a plurality of practices means to embrace the plurality of artists responsible for them. And at the point of this connective tissue, we find the core Instant Coffee ethic. Not only were collective members party people, they were people people too. So, for instance, in early incarnations, Instant Coffee’s parties and their predecessors — Jin’s Banana House and the Money House — used the device of the slide show to provide an easy format of participation for all invited, artists and non-artists alike. A practical approach to curating contemporary art, Instant Coffee’s democratizing strategy was also a way to contend with the difficulty of assigning value to artworks. This is a problem, one of positively diluvial proportions, that follows in the wake of post-minimalism. Increasingly, when de-skilled and neo-conceptual, the possible in contemporary practice has become difficult to differentiate from the necessary. The above excerpt from IC’s manifesto—which has served as the collective’s credo throughout their career—suggests that artworks are a medium of social interaction, and in some cases a mere pretext for it; an idea which has subsequently played out in the contemporary art world at large. …creating a ground ripe for misapprehension; but that, too, was part of the act. Those observers who took the IC party for the main event were missing the point. Because inventing an art scene that accommodated and gave validity to the activity of your peers was a kind of utopia – symptomatic, maybe, and expressive of a wider condition — but a utopia nonetheless. It is possible to characterize ICs commitment to inclusion as a practice of extreme courtesy, an idea that is fully in keeping with the collective’s ethos. 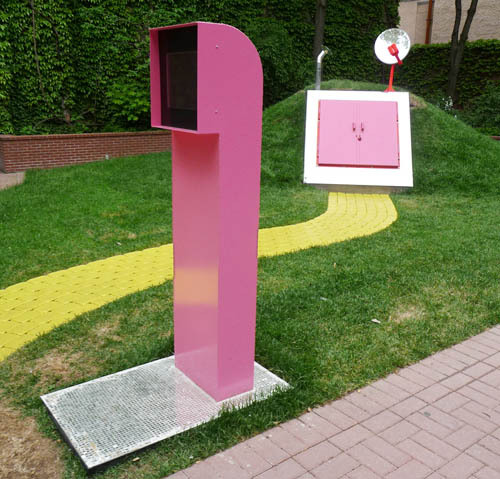 Which is why their Toronto Sculpture Garden project is a departure in more ways than one. 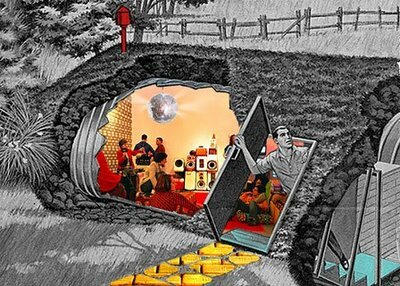 With the inception of the Instant Coffee Disco Fallout Shelter, the question arises as to who now is being served? For the outside observer, a look into the sculpture’s video kiosk reveals the collective to be inside the shelter hanging out; business, for them, as usual. But six people living cramped together in an underground space — what kind of paradise is this? By choosing to sequester only IC’s immediate members, and by making an artwork out of that decision, it is as if the collective has devolved into real personalities. They have become the artwork. It is a hard won conclusion to this story—or at least this chapter of it. The IC Disco Fallout Shelter probably has always been IC’s inevitable destination. Thomas Crow, Modern Art in the Common Culture, Yale University Press, New Haven and London (1996) p. 3. This text was written to accompany Instant Coffee’s commission for the Toronto Sculpture Garden in 2009. You are currently browsing entries tagged with Instant Coffee at Army of YouTube.